« CPU based password cracking is not dead! 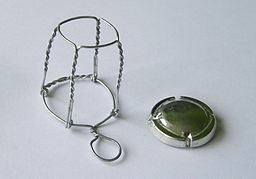 When opening a bottle of champagne you have to remove the wired cage that sits on top of the cork. This wired cage is officially called the ‘muselet’ and it is loosened by removing the foil and turning the wire counter-clockwise. If you are like me you probably have never paid attention to the amount of turns it takes. But a friend once noticed that it always(!) takes 6 turns if you do by hand, or 3 if you count full 360 degree turns. That was years ago, and since then we have tested many bottles on the amount of turns. The outcome has always been the same, regardless of the brand or type of champagne. But we also noticed bottles of Cava, Vonkelwyn, Sekt and Crémant de Bourgogne have the exact same number of turns. So I got really curious. I kept on asking myself ‘Why does it take 6 turns to open the muselet?‘. By the way, this is the moment where you may think “Nah, that’s not true, I don’t believe this guy. All these thousands of champagne houses all use the exact same number of turns… yeah right”. I challenge you. Go buy a bottle, count and let me know. As I didn’t know the answer I started asking people that really should know this: people working in the champagne business. I asked the owner of my local liquor store, some importers of champagne, the owner of a champagne bar in Amsterdam and even the guide of a tour through the cellar one of the big champagne houses. Answered ranged from “Good question, I never noticed that” , “I don’t know” and “I guess it’s because of the tradition” to “6 refers to the pressure of 6 atmosphere in the bottle” and “6 is what French see as the number of intense happiness”. None of the answers were spoken out with confidence. Not happy with these answers I kept on asking. And after searching for a long time, hearing many different answers and checking online I have come to the conclusion that it has to do with pressure, standardization, ease of opening and manufacturers of the muselet. Sources are not very clear on who exactly invented the muselet. But is is clear that Dom Perignon and Adolphe Jacqueson made important contributions. Dom Perignon is believed to have made important improvements to the production process of champagne. Including a wire caging on the cork. At that time a lot of bottles were lost during production because the cork or the bottle was unable to withstand the pressure of the Champagne. Dom Perignon’s invention made it better. But it wasnt until 1844 that Adolphe Jacqueson made the muselet in the shape and form as we know it today. Perhaps Adolphe also decided that six turns, or 3 full turns, was the best way to do it back in those days. Perhaps the number 3 for the full turns was an optimum between the amount of power to resist the pressure from within the bottle and the length of the wired leaflet so that you can remove it easily. During the years many things got standardized. From the grapes to use, the area where it may be produced to the size of the bottles. This is all agreed by the Comité Interprofessionnel du vin de Champagne. In the end also the amount of turns of the muselet was agreed upon. Having it standardized makes sense to have a strong brand. But in this case it has second added value: ease of opening by the sommelier. A sommelier should provide good hospitality and service to it’s guests. It was (and still is) regarded a good manner when the sommelier can open a bottle whilst looking to his guests instead of the bottle. So, having a standard number of turns makes it easier for the sommelier and keeps the guests happy. So now we know why Champagne bottles all have muselets that require 6 turns. But, that still doesn’t explain why Sekt, Vonkelwyn and Cava also require 6 turns. Turns out there is a pretty easy explanation. There aren’t that much manufacturers of the machinery that can put a muselet on a bottle. These manufacturers create the machines that are sitting in the production line at the perimeter of the Champagne houses, and can process up to hundreds of bottles a minute. I was told by a spokesman of a famous Champagne brand that there are only two manufacturers in Europe that deliver to Champagne houses. One in the Champagne region, the other in Italy. And they produce all the machines used for putting the muselets on the bottle. So let’s say you want a muselet that requires 10 turns for your Prosecco. Then the manufacturer needs to alter their machinery. This results in more expensive machinery and you probably going for the cheaper 6-turns option. And the cheaper option also happens to be supported by a great tradition of Champagne. So, easy choice. So, there you have it. One more answer to a question you probably never asked. But sure a fun little topic you can entertain your guests with the next time you open a wonderful bottle of champagne. Cheers! Oh, and let me know if you heard a different answer or if you happen to find a bottle of champagne that does not require 6 turns! Update 2011-03-27: declared more specific that the machinery of the manufacturers are situated at the perimeter of the Champagne houses and that the muselets are not shipped to the Champagne houses. Update 2011-06-05: I was at my little niece’s birthday party recently. Learned that kids champagne (not with real alcohol, just soda that looks like champagne) also comes in bottles of which the muselet requires six turns. I did not expect this, but it does make sense. Update 2011-06-15: I’ve visited the champagne region as I was in the area after the 24 hours of Le Mans. I did the tour through the cellars of Mumm. After the visit I asked the guide about the mystery of the 6 turns. Apparently I was the first ever to as this question, and clearly they did not have the answer. Update 2012-02-06: Magnum champagne bottles also require six turns. Sounds logical, but just wanted to let you know. 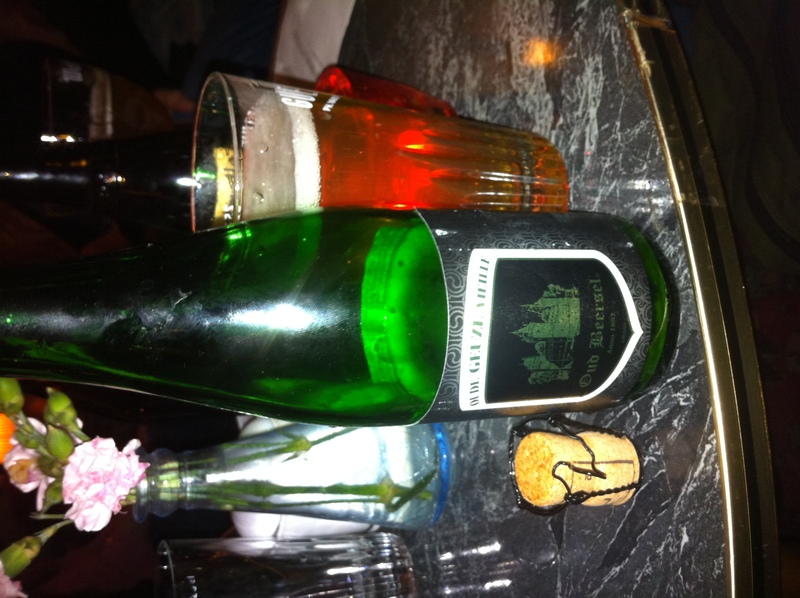 Update 2012-04-12: I’ve tried champagne beer a few days back (= beer modified to taste a bit like champagne, also called a ‘Gueuze‘). More specifically I tried ‘Oud Beersel’ and my friends tried two other brands. They comes in a small bottle, with a champagne cork and a muselet. They all required 6 turns to open. Update 2013-01-12: Hungarian sparkling wine also requires six turns. Update 2013-04-18: based on comments updated and included Adolphe Jacqueson as an the inventor of the muselet in the shape and form as we know it today. This entry was posted on 2011/01/09 at 13:37 and is filed under Champagne. You can follow any responses to this entry through the RSS 2.0 feed. You can leave a response, or trackback from your own site. standarized machine to put the muselet on the bottle? Questions, questions, questions. I haven’t looked into these yet, but I can imagine that the shipping can be done easily with some clever packaging. The fitting of the muselet over the cork is easily done by machines, all dimensions (of bottle, cork and muselet) are standardized. I will dive into these questions further and update accordingly. The six turns are to represent the six regions of champagne. Thanks for the comment. I haven’t heard that on yet, but that’s not a reason why I can’t be true. Have you got any reference for it? Also, I thought the champagne region has 5 sub-regions: Aube, Vallée de la Marne, Montagne de Reims, Côte des Blancs and Côte de Sézanne. What would be the sixth one? Mmmmm…. Yeah, Bob is wrong. There’s only 5 sub-regions to Champagne and no correlation to the turns of the muselet. And while I appreciate the need to find an answer to such curiosity, it’s most pertinent truth would be the physical requirements as the wire mesh became smaller, to combat the pressure (sometimes in excess of 90 psi) as well as have enough of a grip for any adult’s fingers to clench and twist, 1 full rotation was not enough, 4 was excess, 2 was safe, but 3 was perfect. It’s always stated as 6 half twists. And a small correction- Perignon did not invent the Muselet, it was Jacquesson. According to Wikipedia, it was Adolphe Jaquesson that invented the muselet in 1844. http://en.wikipedia.org/wiki/Champagne Thanks for the fun read! Hi Bob, thanks for the remark. At the time I wrote this blog the wikipedia article didn’t had any mentioning of Adolphe Jacqueson (http://en.wikipedia.org/w/index.php?title=Champagne&oldid=405938304). internet. Now I know there is even an “mystery” around this…. Fascinating! I just learned how to turn these muselet into small chairs for my fairy garden. So glad to find your blog. I’ll be sure to link back when I post. Cheers! I’d like to see something on how the muselets are actually manufactured…. gotta be a machine, and a simple process… would to see it in video or at least get a written description on how it’s made. Yes, I’d love to see a video of such a machine. Must be complicated with all the twisting and weaving going on, and at such high speeds. I have asked the said question of why to every wine maker I have every met and never had an answer! Glad i’m not the only one seeking the answer too! Thanks for all your input and suggestions… not sure there will ever be a definitive answer! actually the bottle gets turn 6 times when fermenting to complete a round, champagne bottles get turned every day either by machine or by hand (still happens). there is your 6 cycle and so when unturn the cycle it should be six (6) times, this comes from Moet and Chandon, who ia have represented for 5 years , i train restaurant n hotel staff . Hi Alfonso, I believe you are talking about turning the bottle, which indeed is done daily and sometimes by hand. But Im talking about the turns of the muselet. Funny thing, Ive been to Moët and Chandon, did a tour and asked the specific question this blog post is about. Two tour guides, as well as a present sommelier were unable to answer the question about why exactly the muselet requires 6 turns. ‘Bengal civil servant, director of the East and West India Dock Company and founder of the Universal Life Insurance Company, Augustus Bosanquet (1792-1877) wrote to the Society of Arts on 27th December 1842 about his design to ensure the safe transportation of champagne to the East Indies. It was well known, he said, that the motion of ships and the high temperatures led to ‘so great a loss from ullage as to render most experiments of this sort not only profitless but injurious’. Having worked in manufacturing, my suggestion is that it is not a question of 6 x 1/2 turn but 3 full turns. I would surmise that it is a reason of materiel economy whilst maintaining its function. The machines are all standard, yes. They settled on 3 turns due to metal fatigue/ work hardening of the wire. Also the length is the minimum permissible using the current design of muselet, which lowers cost and allows the stowage of the ring neatly below the swell of the cork. This looks neater under the foil too. The muselet is tapered and allows them to be stacked in boxes for transport. These stacks are then loaded into the machine where they’re picked and placed on the bottle. The machines are usually made to fit a range of bottles using a system of “Change Parts” and adjustments to the programming. There’s not many companies making muselet fitting machines because there’s not many new plants opening up. The sensible money buys kit from experienced manufacturers, who make their money back fro spares and service packages, or they try to.